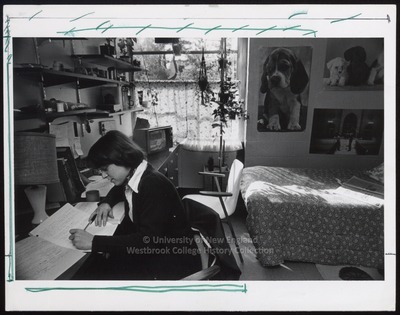 "Student at Desk in Resident Hall, Westbrook College, 1970s"
A Westbrook College student works at her desk in her Resident Hall in this 1970s black and white photo from Ellis Herwig Photography, Cambridge, MA. The Resident Hall is made of cinder block bricks so the Hall interior is either Ginn, McDougall or Linnell. The young woman writes with her left hand and records in a spiral bound notebook. A small, portable television sits on the other end of her desk. Plants and a sun-lit curtain decorate the window. Posters of puppies hang on the wall and a bright quilted bedspread adorns the bed.